'Arguments In Review Petition Defamatory To Lord Ayyappa & Young Girls': Devotee Seeks Intervention In NSS's Review. 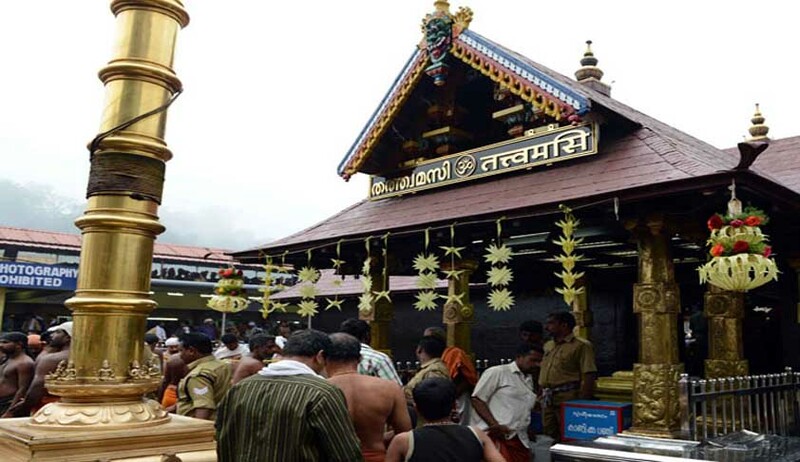 A lady devotee of Lord Ayyappa, who is also the mother of a 14 year old girl, has filed an application for intervention in the review petition filed by Nair Service Society(NSS) against the Sabarimala judgment on the ground that the contentions in the review petition are defamatory to Lord Ayyappa and young girls. In the review petition, NSS has contended that "As the deity is a Naishtika Brahmachari, only females before the age of 10 and after the age of 50 years are eligible to worship him". NSS has contended that Court wrongly concluded that the basis of prohibition was physiological nature of women. According to the review petition,the practise was rooted in the “naishtika brahmachari” character of deity, as per which the deity cannot be in the presence of women. Taking objection to this contention of NSS, the lady devotee has filed the application stating that "the contention(in the review petition) that a ten year old girl’s presence will affect the celibacy of the ‘Lord Ayyappa’ is a derogatory and offensive remark not only against the ‘Lord Ayyappa’ but more so on children of such tender age". "It is respectfully submitted that the so-called tradition of classifying this age group of 10 to 50 as unfit for entry to a place of celibacy is an outright indication that such children and women are only objects for sexual gratification and hence they are not ‘moral’ in a sacred space. The exclusionary practice and insistence on the same, based the very concept that a child of ten years and above as a threat to celibacy of the deity, is against all tenets of Hinduism", submits the application. It is further stated that "millions of Ayyappa devotees are deeply saddened by such aspersions spread in the name of ‘Lord Ayyappa".Such reckless arguments in the name of celibacy of ‘Lord Ayyappa’ diminish and defame ‘Lord Ayyappa’. The contentions are derogatory against the entire womenfolk as they are perceived to be lascivious. The application goes on to state : "The contention that the deity is a celibate because of which children as young as 10 year old cannot enter the temple is rooted on the belief that a ten year old can cause the breach of celibacy. Such an argument is outrageous and grossly misogynistic and thwarts the dignity of children and women on the very face of it. Such reckless arguments in the name of celibacy of Lord Ayyappa diminish and defame the Lord Ayyappa". "It is further a matter of grave concern that such archaic beliefs also leave scars on the psyche of young girls. Such beliefs cause a girl child to believe that she is also an object capable enough to evoke sexual desires even in a God. Such maligned indoctrinations go lengths to stir up a man’s psyche that can result in sexual abuse and violence on women". The applicant states that the stand of the review petitioner that a girl of even 10 year old cannot enter Sabarimala temple because of the celibate nature of the deity should be strongly reprimanded. It is highlighted that the contentions and arguments of the review petitioners are widely circulated and debated in the print & electronic media and also in the public speeches delivered by NSS in their "contumacious" protest marches against the judgment of SC. "The speeches contain explicit reference to sexuality and the same are sending negative images about Lord Ayyappa in the minds of the population, especially younger generation", states the applicant. The application also states that the Review Petitioner has not even considered the evolving of our society from following the primitive man-made practices to an egalitarian approach in temple entry. "Before the God, all believers are equal and less mortals like humans can never challenge the status of God in any form. The Review Petitioner has chosen to look away from the times we live in by continuing to live in the dark, overlooking the progress we have made, both societal as well as jurisprudential".